The New York Giants are excited about the opportunity to have Josh in the building learn from Eli and his extensive experience at the position, and eventually help this team beat the Patriots a few more times. With the first pick in the 2019 NFL draft the Arizona Cardinals select......Kyler Murray QB Oklahoma. We didnt want to have any confusion in our QB room come camp day 1. We have been in some talks with the Giants and other teams about the 1st pick but this deal just come up at the last second. Now we have a young QB with a bright future to build upon and extra picks to help make him succeed. San Fran 49ers are on the clock! If you find someone drunk enough on this board to give a second for Rosen take it, but trade down and take Lock. always easier said then done, trying to move down is always beneficial with how the rookie wage scale is and the 5th year option in the first round. Trying to actually get a trade partner to move up is very difficult. Most analysts gave Rosen a higher grade than Lock. And in this case; most = almost every. One season behind a TERRIBLE OL and offensive playcalling and now he’s not even worth a 2nd? The 2004 QB class teams are the ones in play imo. 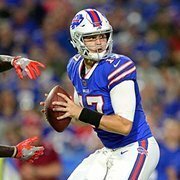 Eli, Rivers, and Ben are all on the way out. Let him sit a year and learn about game prep from a true pro. I figured. Currently playing on xbox. Was about to piece a new rig together when I got hit with an unexpected surgery. The skins and dolphins as well, unless they plan on tanking for their QB next year. If that’s the case, just tank 2 years for Lawrence. I figured. Currently playing on xbox. Was about to piece a new rig together when I got him with an unexpected surgery. In the real world this will be about the best the Cardinals can expect. Their clumsy handling of their Murray love has reduced their leverage. Not a big fan of any really. Lock I believe has the best chance to succeed and is the only one Id take in the first. Rosen is talented but doesnt have that it factor. I dont see the it factor in Murray either. I do believe Lock seems to have a little of that. With the 2nd pick the San Francisco 49ers select Josh Allen. While the temptation to try to try to trade back is great the chance to get a top edge rusher is greater. It came down to Bosa or Allen and went Allen because it shakes up the draft. Interesting pick but only shakes up 2 picks if Bosa is picked at 3. Bosa should be the pick but as the Jets need outside pass rush. Now pair him with dee ford and could be trouble. I really hope this is the niners pick. I don’t wanna see the jets with their own Josh Allen. I'll be honest: It would not shock me at all if Allen was selected before Bosa. I give it a decent chance of happening in real life. Bosa has the higher floor, but Allen probably has the higher ceiling. You make the assumption that we know what’s a smokescreen and what isn’t.